During 2011 and 2012, I had the pleasure of living and working at La Caseta de Milmanda, managing construction and maintenance works for their organization. The very first project we underwent when I arrived was the building of a green roof over a cob oven to protect it from the elements, and the restoration of the cob oven as it had already been exposed to the Catalan monsoons for a couple of rainy seasons. 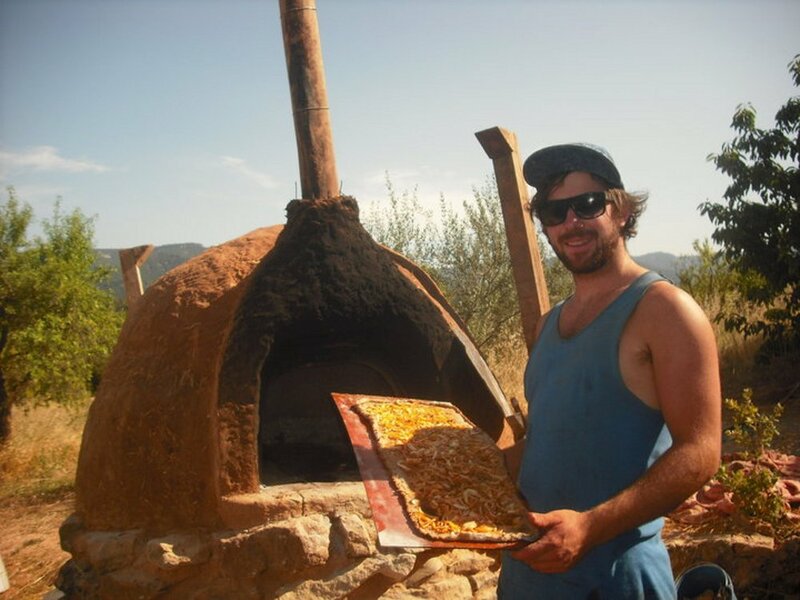 As both the oven and the roof would involve working almost exclusively with natural materials, like round timbers, river cane and cob, we decided to hold a course to both teach people about natural building, and also to get some more hands to help us with our project. 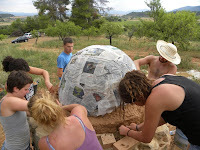 The photos above show the cob oven's original construction, done by Milmanda's volunteer community and led by David Rowe. Some columns had been erected as well, using old railroad ties and telephone poles. So our mission was straightforward enough: put a roof on top of those columns, and then repair the oven once it's protected from the elements. We were also very fortunate in another way: a pair of traveling German Zimmerman carpenters, Flo and Hannes, had heard about La Caseta de Milmanda while hitch hiking in the area, and decided to pay us a visit. The Zimmermans are a guild of carpenters originating in Germany. All of their members are graduates of approved Zimmerman vocational schools, where they learn especially about traditional timber framing and the tools of the trade. After graduating, the next step for a Zimmerman is to embark on a sort of journey, where for some years they travel the world, offering their skills as carpenters in exchange for food and lodging. They also usually dress in the traditional, black-and-white threads of the Zimmerman. I was of course very interested in learning more about timber framing from them, and they were equally interested in learning about traditional Mediterranean natural building techniques from me. So, the green roof and oven at La Caseta de Milmanda became a great learning experience for everyone involved. The Zimmermans were very hard workers, and in no time we had felled some wild pine trees, stripped them of their bark, and framed the roof, half-lapping the joints around the roof plate, and birds-mouthing the rafters into place. Then we harvested hundreds of river canes, or caña, from along a nearby river. After husking them, we assembled them into a river cane deck over the rafters, using a simple traditional method of binding them to the rafters with twine. Traditionally, this twine would have been made from esparto grass, and it's still possible to find professionals who will braid esparto twine. But for our green roof, we used sisal, made from a type of agave, which is much cheaper and easier to come by these days. Don't let the river cane fool you – this is an incredibly strong plant that can be used in a number of ways to make beautiful, natural structures. In traditional Mediterranean building, the most common use for river canes is to form large mats, like what we are doing in these pictures. The river cane is strong and springy, and by distributing loads across several canes at once, you can form a basket-like structure that is very strong. Even on our roof in these pictures, with rafters placed at 2 feet on center, with the canes arranged in the quickest, easiest way possible, a person carrying a heavy load of cob can easily walk across this roof. And once the cob is in place, it binds the canes together and strengthens the roof even more. In traditional Mediterranean building, the canes were usually split into quarters, forming long strips, and then woven together to form criss-crossed mats. These could be put over the rafters like what we're doing, or nailed to the underside of the rafters. Then the cane mat would serve as lathing for a mud or plaster render. On the roof at Milmanda, we would simply render the top side of the canes for strength, and leave the canes exposed underneath for a rustic look. When the canes were installed, it was time to start with the cob. Cob is a very fun and simple method of natural building. It's accessible to everyone, regardless of your physical strength, as everyone can work at their own pace. But, working with cob does require a lot of time, relative to other techniques. 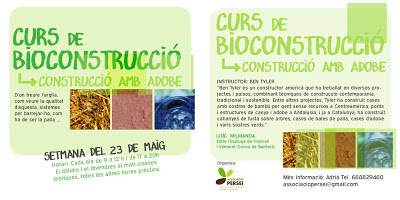 My favorite way of dealing with this aspect of natural building is... throw a natural building event! It's a great way to bring neighboring communities together, meet really interesting people, and get a lot of extra hands helping out on your project. 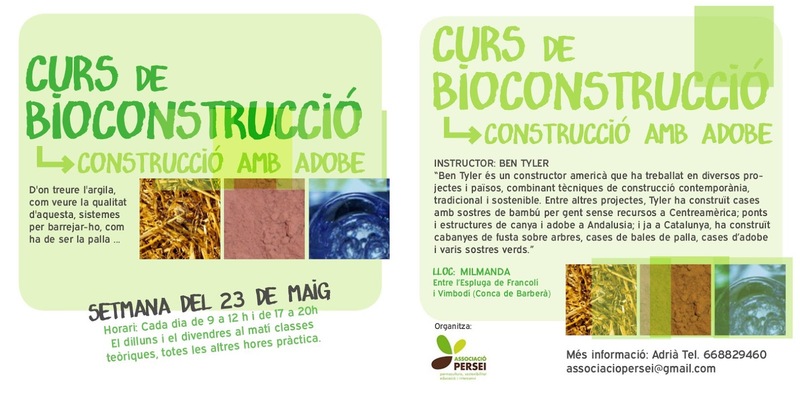 With the help of the organizers at l'Associació Persei, we held a week-long natural building course in May 2011. There were 10 participants, almost all of them coming from a couple of intentional communities located in some nearby mountains. They were keen to learn how traditional, natural building techniques could be used to improve their homes and communal spaces. Combined with the small community workforce ever-present at La Caseta de Milmanda, we had all the help we would need. The natural building course began with an afternoon in the classroom. We talked about traditional building methods of the region, and how the people used to rely entirely on locally harvested material for their building projects. We looked at the different professions that arose as people strove for excellence in different mediums. Timber framing is a classic example of a profession surrounding a locally harvested material. Cañicero is a traditional Mediterranean profession that works exclusively with the caña, or river canes, that are abundant along the coast. The cañicero would build cane ceilings, as discussed above, so that the ceiling would be ready for plastering. Tapial is another traditional profession, which deals with building from clay-rich rammed earth. The Spaniards brought the profession of tapial to South America as well. We also discussed the history of the green roof. Although it originates from Iceland and Skandinavia, not the Mediterranean, it has become quite popular across Europe in recent decades. We looked at the advantages and disadvantages of the green roof, as well as different types and different techniques for building them. Then we set to work, applying what we had learned in the classroom. We analyzed the soil in different areas around the property, and learned how to deduce the proportions of clay, sand and silt present in the soil. We learned how and when to add extra ingredients to the soil, like extra sand, small gravel, straw, animal manure, or cow's blood, all of which are common ingredients used in Mediterranean earth mixes. The mix we used for strengthening our river cane roof included sifted clay-rich soil, extra sand, and some bedding from a nearby horse ranch. This bedding consisted of straw soaked with horse urine and manure – perfect material for cob! After we ensured there was a good strong deck over the rafters, we were able to finish the green roof. The most crucial component of any green roof is the waterproof membrane. All other materials used in this project were natural, locally harvested, and free. But for the waterproof membrane, it's important to bend the rules a little and go get a nice, big, expensive, petroleum-based water barrier. The most common options out there are rubber, bituminous membrane, or pool liner. In all three cases, what we're going for is a thick, durable, seamless sheet. It has to be strong enough to withstand years of use: the edges will be exposed to sunlight, the whole thing will be exposed to the elements, and the roots of plants growing up there will be constantly probing for any weak point, like a seam, that they can wiggle their way into. Over the waterproof membrane goes a drainage layer of river-polished gravel. Then there is an optional step of putting in a root barrier to help keep the plant roots in check, and depending on the material used, to prevent the soil from washing down into the gravel and clogging up the drainage layer. Finally, on top of this goes the soil, some seeds and plants - preferably native, self-seeding, resilient grasses and flowers that don't mind dry soil. With the green roof finished, the cob oven was now safe and sound in its new home. The one dilemma with the oven was that we needed to redirect its chimney to avoid the new roof. We chiseled off the archway and resculpted it, this time incorporating a chimney much larger in diameter that passed over the top of the oven, like a mohawk. We used three different clay mixes for this: a sandy, fire-resistant mix was used to line the inside of the arch and chimney; a straw-rich cob mix was used for the bulk of the sculpting, as it's a structurally stronger mix; and finally, we gave the whole cob oven a fresh, final render, with extra horse manure in it. The manure is full of little fibers that help bind the mix together (it's common to use finely chopped straw instead, if you don't enjoy working with animal manure). The hole you can see in the back of the mohawk, under the stovepipe, is a creosote trap where a jar collects resins and water vapor as it is released from the wood smoke in the metal stovepipe. The creosote can be collected, watered down, and used as insect repellent for plants. Working on the green roof and cob oven at La Caseta de Milmanda was a great project, and it became a big learning experience/skills exchange for everyone involved. One of my favorite aspects of this job was getting to meet so many excellent people, from Flo and Hannes the German Zimmermans, to our new friends from the nearby intentional communities, to all the great people of the community at La Caseta de Milmanda. I also really enjoyed getting a chance to live on site with the newly restored cob oven, under its green roof. I had a chance to witness the Milmanda community transform that space into a communal gathering area, and many a great pizza party has been held under that green roof ever since. I hope it serves them for many years to come. Ben this is amazing and truly beautiful! Natural building for me is a holistic approach to building that draws from regional, traditional skills and from modern advances. It's a return to natural materials with new insights in environmental sustainability and social justice. I believe natural building is an important step towards a happier, healthier, more sustainable future for all of us. My interests beyond natural building are in community development, which I incorporate in my work by leading natural building workshops and seminars for non-professionals. I hope that through my workshops I can empower people and give them the skills they need to create low-cost, low-tech, low-impact solutions to modern-day problems. I have experience with contemporary and traditional construction skills in North America, Latin America and Europe. I've worked with local governments and NGO's on low-income housing construction; non-profits in housing and sustainable agriculture development; and with private companies in renovation and construction. I'm certified in Permaculture Design through the British Permaculture Association, and I hold a graduate certificate in Nonprofit Management. This blog is ad free. In the spirit of spreading helpful information with no desire for personal profit, my blog will always remain ad free.